After a break we are back with yet another line of great events. We are starting out by inviting two of Finland's most prominent sound systems; Healing of the Nation and Ivah Sound. Healing of the Nation is one of Finland’s oldest sound systems, keeping it true to the roots of the culture. Come and experience the thundering sounds and dance together in unity! 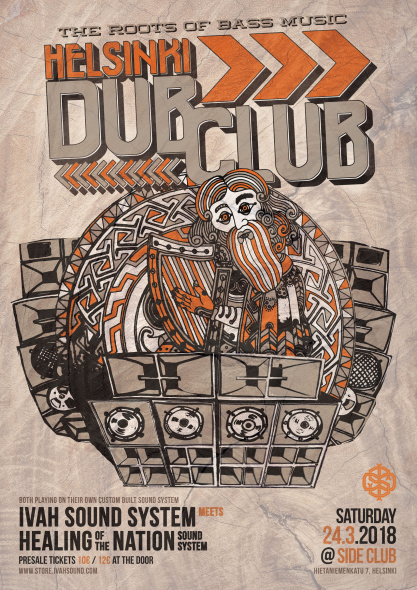 This event is a part of the HELSINKI SOUND SYSTEM WEEKENDER that takes place in Helsinki from 23-24.3.2018 featuring High Kulcha - Intergalaktik Sound System in Merikerho on Friday 23.3 and Helsinki Dub Club - Healing of the Nation & Ivah Sound System in Side Club on Saturday 24.3. And more! Tickets for the weekender and more info will come soon! Healing of the Nation is one of Finland’s oldest sound systems who are still active to this day. Healing of the Nation have performed all around this country, spreading roots and culture vibes for soon twenty years. The crew itself has developed, but the message of peace, love and unity has always stayed strong. HOTN plays heavyweight dub and foundation roots music together with microphone chanting and live effects. Tickets and more info soon!